The government of Zimbabwe has ordered the country's commercial banks to sell all foreign currency to the central bank or the state-owned national oil company until further notice. The measure, designed to help the government acquire hard currency to pay overseas debts, comes as as Zimbabwe experiences its worst economic depression. It means that companies will be unable to pay foreign suppliers in anything but the Zimbabwean currency. And exporters will be forced to accept the official exchange rate of 55 Zimbabwe dollars to US $1 instead of the market rate of 80 to 1. Economists are warning that the new policy will be a disaster if it lasts for any length of time. The authorities say the temporary foreign currency distribution rules will last only a few days. But economist John Robertson said that it would need to last two months to pay salaries to diplomats and outstanding rent on the country's foreign missions. In a separate move, Zimbabwean President Robert Mugabe's ruling party has called on two Supreme Court judges to quit. Government critics believe that Zanu-PF is trying to tighten its grip on institutions which have demonstrated their independence. The official Herald newspaper quoted Zanu-PF spokesman Jonathan Moyo as saying a meeting of its members of parliament on Friday passed a vote of no confidence in the country's highest court of appeal and urged justices Nicholas McNally and Ahmed Ebrahim to resign. Mr Moyo said the judges had usurped parliament's powers by recently overturning a government ban on election result challenges. But Justice McNally, who is white, has turned down the request while Justice Ebrahim, who is of Asian origin, has indicated he wants to consult his family, the paper said. Sternford Moyo, president of the Law Society, told the BBC that if the judges agreed to resign in such circumstances it would set a precedent, making it difficult for the courts to rule against the government. Neither the president nor parliament has the power to sack a judge outright. A week ago, Anthony Gubbay, the chief justice, was forced to agree to retire after being told by the government that decisions had been incorrect and his safety could not be guaranteed in the wake of threats from ruling party militants. THE Zimbabwean government has stepped up its campaign against The Daily News, the independent newspaper whose printing presses were blown up last month after a long campaign of intimidation by President Robert Mugabe. The newspaper, an implacable opponent of Mugabe's regime, has been printed since the bombing on presses belonging to Natprint, a plant in which the government has a majority share. It has also continued to appear on the internet. In what was clearly a politically motivated decision, however, Natprint has been ordered by the authorities to end the arrangement. It could pull the plug on The Daily News by the end of this week. The move appears to be part of a concerted campaign by the government against any opposition to its rule. This weekend two Supreme Court judges - one white and one of Asian descent - were threatened with violence if they did not step down. Anthony Gubbay, the chief justice, has already been forced to retire at the end of June, a year early. At The Daily News, morale is said to be surprisingly high, although staff are nervous. "The Mugabe government still hasn't condemned the bombing," said Geoff Nyarota, the editor. "The final insult is that Simon Moyo, Zimbabwe's high commissioner to South Africa, has actually told South Africa's biggest daily, The Sowetan, that maybe we planted the bombs ourselves." Although no evidence has yet appeared to link the government to the bombing, the Commonwealth Press Union (CPU), which monitors press freedom, has joined a growing chorus criticising the attack. In a letter to Jonathan Moyo, the minister for information - who described the newspaper as a "threat to national security" - the CPU expressed "deep concerns" over the future status of the independent media in Zimbabwe. The fact that The Daily News is still appearing on the streets is something of a miracle. Prior to the bombing it sold up to 120,000 copies a day. For the past two weeks it has been printed three days a week at the Sovereign plant, which produces Zimbabwe's other independent weeklies, and three days a week by Natprint, which also prints The Herald, its state-owned rival. The arrangement is highly unsatisfactory, however. The cost is prohibitively high and the newspaper is also much smaller than usual, losing it valuable advertising revenue. "The presses we're using now are so old and slow that even though we've had to impose almost impossibly early deadlines on our reporters, there still isn't enough time to print even 70,000 copies," said Much Masunda, the paper's chief executive. "It takes us six hours of all-out manual labour by hundreds of people working like crazy physically to collate the pages. I'm not sure how long we can go on like this." oMore than 300 Sunday Times readers - many of Zimbabwean origin - have responded to an appeal launched by this newspaper to raise £1m to help The Daily News buy new presses. The Sunday Times has made an initial donation of £5,000. "I was very upset when I saw what happened," said Quenton Kelly, 42, a conservationist from Enfield, north London, and a former Zimbabwean resident who still has relatives in the country. "The survival of The Daily News is critical in a dictatorship." Another reader, who declined to be named for fear of reprisals against his children in Zimbabwe, said the attack was appalling: "The Daily News is one of the few means of accessing the independent voice in Zimbabwe - it must not be silenced." Derek Smail of African Media Investments, the paper's biggest backer, said this weekend that the company had identified several presses in Britain that would be suitable. "Rather than deter them, this bomb has harnessed even more [the reporters'] determination to print the news like it is," he said. supporting the opposition in Zimbabwe. development programmes," Fill said, adding "it was all very comprehensive." south-eastern town of Chikombedzi, with more than 10 patients already dead. other cases had been treated and discharged. Zimbabwe seeking treatment might have brought the disease into the area. disease reportedly spilled over from neighbouring South Africa. Harare - Robert Mugabe's onslaught on voices of dissent in Zimbabwe ahead of next year's presidential elections has intensified dramatically after his ruling party resolved to replace the five members of the independent supreme court. The court is made up of two whites; one Asian and two blacks. Mr Mugabe regards all of them as representing the interests of the - by now, tiny - white minority. Internationally, the court is viewed as the main barrier between Mr Mugabe and the imposition of absolute tyranny. The government says it will appoint an acting chief justice to take office on 1 March, pending the retirement of chief justice Anthony Gubbay who will go on leave until his departure. Mr Mugabe's officials told Mr Gubbay that unless he relinquished his post they could no longer guarantee his safety from government supporters who had vowed to kill him. Mr Mugabe has also imposed a vicious crackdown on the country's small but vibrant independent media and main opposition MDC. "He is obviously terrified and is sensing the end of his reign in presidential elections next year," said University of Zimbabwe political scientist John Makumbe. "Having cowed most Zimbabwean voters through a campaign of state sponsored terror, he has now shifted his focus to the remaining bulwarks of democracy - the judiciary and the media." Twelve days ago, the printing press of Zimbabwe's only independent daily newspaper, the Daily News, was bombed, just one day after Information Minister Jonathan Moyo had vowed to "silence the independent media". Members of the Zimbabwe army have been deployed in townships where they have beaten up legislators and supporters of the MDC. Judges have incurred Mr Mugabe's wrath by ordering self-styled war veterans and ruling ZANU-PF party supporters to end their illegal occupations of white-owned farms. The government says it wants to redistribute much of the land that has been owned by the tiny white minority since colonial days. It has shunned advice from donors to formulate a proper land resettlement scheme preferring instead to use violence to capture peasant votes. The ageing Mr Mugabe (77 this month), who has run the country since all-white rule ended in 1980, has vowed to continue assailing the judiciary so long as it protects the legacy of British colonialism, which left the tiny white minority in control of vast swathes of fertile agricultural land. His ruling ZANU-PF party convened an emergency parliamentary caucus meeting on Friday which agreed to remove all white judges. After the meeting, Justice Minister Patrick Chinamasa immediately informed the two remaining non-black judges of the supreme court, Justices Ali Ebrahim and Nick Macnally, that they were no longer wanted on the bench. The two justices have since refused to go and Mr Chinamasa is also expected to inform the two black judges of the five-member supreme court, Justices Wilson Sandura and Simba Muchechetere, that their services are no longer required. They have been accused of concurring with the white judges in passing judgements that are "anti-black". If all the justices eventually cede to Mr Mugabe's pressure to go, as they are widely expected to do, he will then fill the courts with his own henchmen. University of Zimbabwe law professor Lovemore Madhuku said: "It's unconstitutional but that's not the issue now. The point is there is no longer any rule of law in Zimbabwe." Apart from the bombing of the Daily News' printing press, at least 14 journalists and photographers have been assaulted by ruling party supporters in the past four months. Last Saturday, riot police officers prevented nearly 100 journalists from holding a peaceful march to protest state harassment. "What the government seems to want is a media that sees no evil, hears no evil and speaks no evil," said Daily News Editor-in-Chief Geoffrey Nyarota, who himself escaped an assassination attempt when another bomb exploded near his office last May. Western leaders, particularly Tony Blair, have continued to treat Mr Mugabe with kid gloves. "It is high time the West got tougher with Mugabe. Some political sanctions against members of his entire government are now long overdue," said Professor Madhuku. Bulawayo - Chief Justice Anthony Gubbay has been invited to the United States where he is expected to appraise the Americans on the situation in Zimbabwe with regard to the rule of law. Contacted for comment yesterday, the Chief Justice refused to comment, but this paper has it on good authority that Gubbay has been invited to the USA. It was not immediately clear whether he had accepted the invitation from the Bush administration. Gubbay's invitation follows that of the vice president of the MDC, Gibson Sibanda, who left for the US last week. He is expected to meet with State Department officials and members of Congress during his visit. The official invitation sent to the opposition ahead of any formal meeting with government is set to sour relations between Harare and Washington DC. Sibanda, who is fresh from answering allegations of inciting public violence, is expected to spend a week in Washington DC. MDC secretary for legal affairs, David Coltart, said: "Sibanda will meet State Department officials and members of Congress to discuss the current state of lawlessness in Zimbabwe and the assault on democracy being perpetrated by the government." The MDC leader is also expected to use the occasion to explain the situation in Zimbabwe. In the past four months, the MDC has alleged harassment and assaults of its members by state agents. "The latest of this ongoing onslaught on the MDC is the arrest and the remand of our vice president, Sibanda, on spurious grounds and we hope to take this opportunity to discuss those issues," said Coltart. Political scientists interviewed by The Standard felt that the new Bush administration's decision to invite the opposition ahead of government was a clear indication the US would not treat the government with kid gloves on matters pertaining to democracy. Harare - President Robert Mugabe is believed to be planning an early presidential election, using a new campaign of repression involving bomb attacks and midnight raids to silence his critics. The latest attacks, designed to crush the country's last bastions of free speech, target judges and newspapers as well as opposition politicians, and are being interpreted as a clear warning that the Zimbabwean leader will use whatever means necessary to secure another term. Intimidation worked in last year's parliamentary elections when Mr Mugabe's Zanu-PF Party saw off a strong opposition challenge. In one incident last week, Job Sikhala, a backbencher from the MDC, was seriously assaulted by 50 soldiers who raided his home at 4am. They also beat up his pregnant wife and his sister. Gibson Sibanda, the deputy leader of the MDC, was arrested last week and charged with "incitement to violence" under legislation originally passed by the British colonial government to jail black nationalists. Last weekend, two peaceful demonstrations by the MDC and journalists from the independent press were dispersed by hundreds of riot police armed with batons and tear-gas. Senior officers warned that no gathering would be tolerated. The protests, hastily aborted, followed the bombing of the printing press used by the Daily News, an independent newspaper fiercely critical of Mr Mugabe. Three anti-tank landmines ripped apart the heavy rollers and blew off the roof, causing damage that could cost £1 million to repair. According to Michael Quintana, editor of Africa Defence Journal, only the Zimbabwean army has the technical capability to carry out such an attack. He asked: "At what point will Western diplomats in Harare get off their high horses and urge their respective governments to declare Zimbabwe and President Mugabe's government a rogue state?." Five days after the bombing, the government turned on Chief Justice Anthony Gubbay, under whose leadership the Supreme Court has infuriated Mr Mugabe by declaring his land grab to be illegal. After months of pressure and vilification, Chief Justice Gubbay finally resigned, and observers now fear that the courts will be packed with pliant judges. 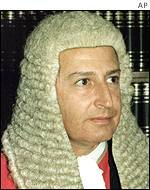 Yesterday, the official Herald newspaper reported that the ruling Zanu-PF party had passed a vote of no confidence in the Supreme Court and called on two other judges to quit - Justices Nicholas McNally, who is white, and Ahmed Ebrahim. The attacks are seen as spelling the end of Zimbabwe's independent judiciary and free media - the country's last vestiges of democracy. Basildon Peta, secretary-general of the Zimbabwe Union of Journalists said: "You have to be a supporter of Mugabe to live a normal life in Zimbabwe. If you are not, you have to relinquish all your freedoms of speech and assembly. We are under siege, and the worst is yet to come." Mr Mugabe's presidential term ends on April 1 next year and elections must be held at least 90 days before that date. The new campaign of repression indicates that an early poll is planned and that the president intends to use force to overcome his unpopularity amid an ever-worsening economic crisis. The invasion of more than 1,700 white-owned farms by thousands of squatters has made food shortages inevitable. Reserves are well below the safety level and the Grain Producers' Association forecasts a 30 per cent fall in the maize crop, which will be harvested in April and may only last until November. A Western diplomat said: "Unless he wants to have an election with people starving, Mugabe will have to go to the country early. I expect the contest will be held in September. At the moment, we are seeing the removal of all obstacles to re-election." Yet diplomats believe that there is still a small chance that Mr Mugabe, who will turn 77 on February 21, may surprise his critics by choosing to retire. His chosen successor, who would then enter an election as the Zanu-PF candidate, would probably be Emmerson Mnangagwa, the Speaker of parliament. Mr Mnangagwa served in Mr Mugabe's cabinet for 20 years and masterminded the bloody crackdown against dissidents in Matabeleland in the 1980s, which claimed at least 5,000 civilian lives. His expertise at wiping out the opposition would be his chief selling point for Zanu-PF - a party few believe would stand a chance in a free election. The Zimbabwean government has stepped up its campaign against The Daily News, the independent newspaper whose printing presses were blown up last month after a long campaign of intimidation by President Robert Mugabe. The newspaper, an implacable opponent of Mugabe's regime, has been printed since the bombing on presses belonging to Natprint, a plant in which the government has a majority share. It has also continued to appear on the internet. In what was clearly a politically motivated decision, however, Natprint has been ordered by the authorities to end the arrangement. It could pull the plug on The Daily News by the end of this week. The move appears to be part of a concerted campaign by the government against any opposition to its rule. This weekend two Supreme Court judges - one white and one of Asian descent - were threatened with violence if they did not step down. Anthony Gubbay, the chief justice, has already been forced to retire at the end of June, a year early. At The Daily News, morale is said to be surprisingly high, although staff are nervous. "The Mugabe government still hasn't condemned the bombing," said Geoff Nyarota, the editor. "The final insult is that Simon Moyo, Zimbabwe's high commissioner to South Africa, has actually told South Africa's biggest daily, The Sowetan, that maybe we planted the bombs ourselves." Although no evidence has yet appeared to link the government to the bombing, the Commonwealth Press Union (CPU), which monitors press freedom, has joined a growing chorus criticising the attack. In a letter to Jonathan Moyo, the minister for information - who described the newspaper as a "threat to national security" - the CPU expressed "deep concerns" over the future status of the independent media in Zimbabwe. The fact that The Daily News is still appearing on the streets is something of a miracle. Prior to the bombing it sold up to 120,000 copies a day. For the past two weeks it has been printed three days a week at the Sovereign plant, which produces Zimbabwe's other independent weeklies, and three days a week by Natprint, which also prints The Herald, its state-owned rival. The arrangement is highly unsatisfactory, however. The cost is prohibitively high and the newspaper is also much smaller than usual, losing it valuable advertising revenue. "The presses we're using now are so old and slow that even though we've had to impose almost impossibly early deadlines on our reporters, there still isn't enough time to print even 70,000 copies," said Much Masunda, the paper's chief executive. "It takes us six hours of all-out manual labour by hundreds of people working like crazy physically to collate the pages. I'm not sure how long we can go on like this." More than 300 Sunday Times readers - many of Zimbabwean origin - have responded to an appeal launched by this newspaper to raise £1m to help The Daily News buy new presses. The Sunday Times has made an initial donation of £5,000. "I was very upset when I saw what happened," said Quenton Kelly, 42, a conservationist from Enfield, north London, and a former Zimbabwean resident who still has relatives in the country. "The survival of The Daily News is critical in a dictatorship." Another reader, who declined to be named for fear of reprisals against his children in Zimbabwe, said the attack was appalling: "The Daily News is one of the few means of accessing the independent voice in Zimbabwe - it must not be silenced." Derek Smail of African Media Investments, the paper's biggest backer, said this weekend that the company had identified several presses in Britain that would be suitable. "Rather than deter them, this bomb has harnessed even more [the reporters'] determination to print the news like it is," he said. 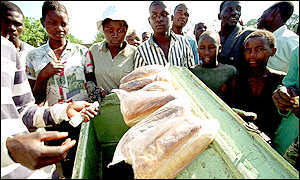 Coming to Zimbabwe in September 1998 showed a remarkable lack of judgement. I envisaged a fairly quiet life in a well-organised, reasonably prosperous country. Everyone kept reminding me that this was "Africa for Beginners", not like the majority of other war-torn, corrupt or impoverished states which litter sub-Saharan Africa. Zimbabwe's descent began just before my arrival, with President Mugabe's decision to send more than 10,000 troops to the DRC, in support of the late president Laurent Kabila. It is a war which has helped to destroy the economy here and fatally undermine support for Mr Mugabe. The government's panicked response in the run-up to last year's elections was to attempt to divert attention by playing up the already highly contentious land issue, while simultaneously unleashing a campaign of violence against the increasingly popular opposition. Last April I attended a ruling party rally at which President Mugabe, dressed army-style in olive green, warned the opposition leader, Morgan Tsvangirai, that he was playing with fire. "Let him not start the fire which may engulf him!" said Mr Mugabe, to cheers of approval. A week later, the police stood and watched as government supporters blocked the path of Mr Tsvangirai's campaign manager, Tichaona Chiminya. The crowd beat Mr Chiminya unconscious before pouring petrol over him and setting him alight. He was one of the more than 30 people killed during the election campaign, nearly all of them from the opposition. It is, of course, Mr Mugabe and his government which started the fire and are still busily fanning the flames. In a desperate attempt to stay in power, apparently unable to imagine a Zimbabwe without it in charge, the ruling party has resorted to intimidation on a national scale. The War Veterans Association has, it seems, been given a free hand to do whatever is necessary to keep the opposition at bay. Black farm workers and their white bosses have been attacked. Occupying white-owned farms and attacking the farmers and their workers is now so routine that it goes largely unreported. A more novel war veteran tactic is to take over the offices of local authorities they believe to be anti-government. Civil servants and teachers are viewed with particular suspicion, mainly because they are well-educated. The police response is usually to do nothing - this, they explain, is political. The lunatics have taken over the asylum. My most vivid image of my time here is of the war veteran leader, Chenjerai Hunzvi, leaning from the passenger window of a truck, wild-eyed and screaming. He was trying to persuade the driver of my car to pull over. This was in the middle of a by-election campaign which, even by Zimbabwe's standards, was remarkably violent. Opposition members of parliament said Mr Hunzvi had personally thrown a petrol bomb at them as they attempted to campaign. Given that, we declined his invitation to stop, and instead performed a hasty U-turn, neatly avoiding another truckload of jeering government supporters in the process. It was all a little too close for comfort. Almost as uncomfortable was a telephone interview with the Information Minister, Jonathan Moyo, two days after the bombing of the printing presses of the Daily News newspaper. I asked if the government intended to abide by the latest Supreme Court judgement - as usual, the court had ruled against President Mugabe. The minister tends simply to hang up when he hears my name, but this time he launched into a tirade against the BBC in general and me in particular. His final shouted words were, "You should be more careful!" The consequences of President Mugabe's decision to abandon the rule of law are obvious - car-jackings and other armed robberies are now routine. Far more serious, though, is the collapse of the economy, which contracted by four per cent last year, and will continue to shrink. It's no longer a question of whether Zimbabwe will suffer food shortages this year, but how severe they will be - and this in a country which traditionally exports food. The government's cynical attempts to undermine race relations are equally depressing. Yes, the fire is well and truly raging, and could well engulf Mr Mugabe along with everybody else.